William Cramp & Sons Ship and Engine Building Company shipyard was founded in 1830 and became a leader in U.S. iron ship building in the late nineteenth century. Located on the waterfront in the Fishtown neighborhood of Philadelphia, the shipyard became a major employer of Kensington and Fishtown residents. During the Spanish-American War, Cramp’s shipyard built the battleships Indiana and Massachusetts, as well as the armored cruiser the New York and the protected cruiser the Columbia. The USS Indiana, Massachusetts, and New York all fought in the Battle of Santiago de Cuba during the Spanish-American War. 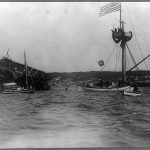 A key event that led to the Spanish-American War was the explosion and sinking of the USS Maine in Havana Harbor in 1898. The explosion killed 260 officers and men on board, and blame for the explosion was initially placed upon the Spanish. The aftermath of the explosion can be seen here, as the twisted remains of theMaine protruded above the water. This assumed attack on the United States motivated many Philadelphians to enlist in the war effort, contributing four regiments of volunteer infantry (the First, Second, Third, and Sixth), one battery of artillery (Light Battery A), and one troop of cavalry (First Troop Philadelphia City Cavalry) for a total of 4,849 soldiers. Wilmington and northern Delaware sent almost three hundred men (Companies A, C, F, H, and K) into the army. 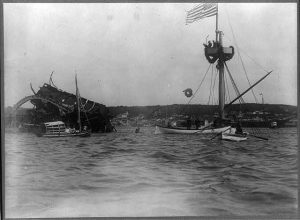 The actual cause of the explosion that sunk the USS Maine remains debated. Although President William McKinley’s administration deemed the explosion the result of an external explosion by a mine, later investigations suggest the possibility that the explosion occurred from an internal coal fire that spread to the artillery magazines. 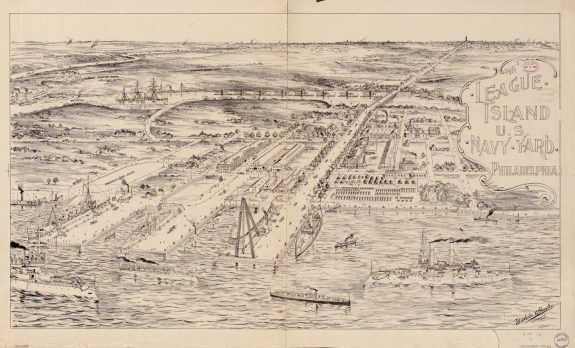 The United States Navy, which had been based in a yard on Front Street at the Delaware River since 1776, sought land for a new navy yard in the 1860s. The U.S. Navy decided that League Island, shown here, would be the site of its new shipyard in 1868 and by 1871 construction was complete. The League Island Navy Yard featured one drydock, built in 1891, but the Spanish-American War created the need for additional drydocks along with new shop buildings. 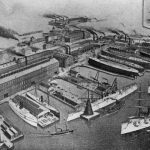 The League Island Navy Yard remained an integral part of the United States Navy through both world wars. The navy finally ended most of its activity at the site in 1990. In 2000, the city of Philadelphia took over the majority of the League Island Navy Yard to redevelop the space for business. After suffering two crushing naval losses and with its armies on the brink of defeat, Spain accepted the futility of continuing the struggle and negotiated an armistice that began on August 12, 1898; a formal peace treaty followed four months later. 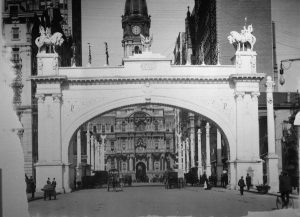 Once hostilities concluded, the city of Philadelphia planned a Peace Jubilee to celebrate the nation’s victory over Spain. The focal point of the Philadelphia Peace Jubilee was a towering, electrically illuminated, Athenian arch, shown here in 1898, that spanned Broad Street near Sansom, bisecting a Court of Honor of ornate columns lining Broad Street from city hall to Walnut Street. The celebration commenced on October 25, 1898, with a grand naval pageant of boats on the Delaware River. Two days later twenty-five thousand soldiers, many from Philadelphia, marched down the Court of Honor under the respectful gaze of President William McKinley. The festivities concluded October 28 with a vast civic parade representing many of the city’s diverse ethnic, social, business, civil, and educational organizations. Spectators traveled from all over the United States to attend, and most major newspapers covered the occasion. Although often regarded as a minor conflict, the Spanish-American War (1898) made a major impact on Greater Philadelphia. As a populous urban center, Philadelphia and its immediate environs contributed a substantial number of troops to the United States’ volunteer army but also provided an outlet for those dissenters who decried warfare. In addition, the war influenced the region’s economy by significantly boosting war-production manufacturing while also creating shortages that affected local industries and consumers. After the successful conclusion of hostilities, Philadelphia hosted a three-day victory festival that drew national attention, but debate continued over the United States’ acquisition of former Spanish territory. 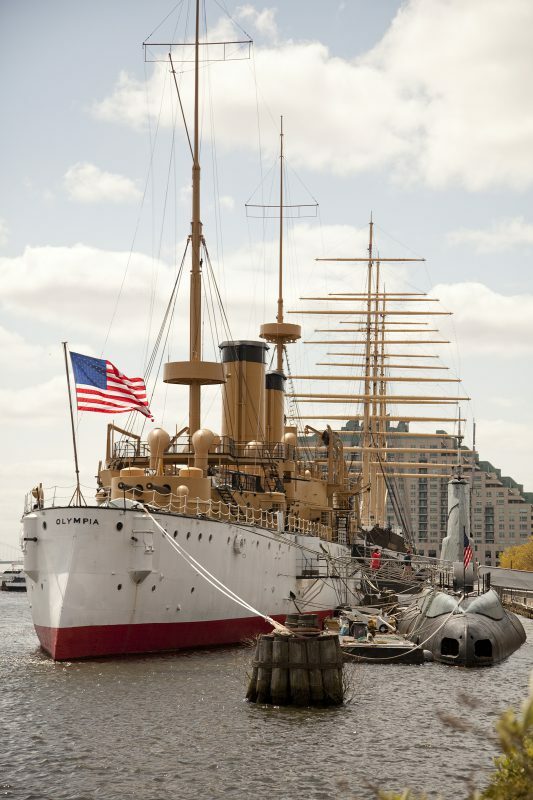 And over half a century later, one of the Spanish-American War’s most celebrated warships became a floating museum docked at Penn’s Landing. The Spanish-American War propelled the victorious United States into the forefront of world affairs, allowed America to take a seat among leading military powers, and established the young nation as a fledgling empire. A unique combination of social, economic, and political pressures helped push the United States into open warfare against Spain, but officially, President William McKinley (1843-1901) asked Congress for the authority to commit American troops in order to liberate Cuba, and its people, from oppressive Spanish rule. Once war had been declared on April 25, 1898, the U.S. government began recruiting state National Guard regiments to create the foundation of a national army. Aroused by months of inflammatory newspaper articles that vividly depicted Spanish atrocities and Cuban suffering, and stimulated to patriotic heights by the sinking of the USS Maine in Havana harbor, Philadelphia-area residents did not hesitate to enlist. Philadelphia contributed four regiments of volunteer infantry (the 1st, 2nd, 3rd, and 6th), one battery of artillery (Light Battery A), and one troop of cavalry (First Troop Philadelphia City Cavalry) for a total of 4,849 soldiers. Wilmington and northern Delaware sent almost three hundred men (Companies A, C, F, H, and K) into the Army. In New Jersey, Camden County opened a recruiting office to fill a proposed Sixth Regiment, but the war ended before the Sixth could be mustered into service. Of all these volunteers only Light Battery A and the First Troop City Cavalry deployed for service overseas, although an armistice was declared before they saw action. Sailors from the area, however, served aboard warships that engaged in combat in both Cuba and the Philippines. Although local support for the war was pervasive, it was not unanimous. The Universal Peace Union, based in Philadelphia and led by Alfred H. Love (1830-1913), condemned armed conflict with Spain before and after hostilities began. Love went so far as to send a peace initiative to the Spanish Queen Regent, by a European courier, after the United States declared war. When this came to light, the Philadelphia Bulletin openly questioned his loyalty, inciting angry mobs to march on his home and burn his bullet-ridden effigy in Chester. Denounced as a traitor, he was even turned away by the prisoners of Eastern State Penitentiary, where he had counseled inmates every Sunday for the previous forty-two years. Meanwhile, the City Council, under political pressure, evicted the UPU from its office on Independence Square. The war economy bestowed benefits but also imposed hardships. On the upside, military manufacturing provided employment for men, women, and even children still suffering from the Panic of 1893. E.I. 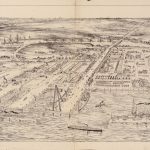 du Pont de Nemours and Company, attempting to supply the government’s insatiable need for gunpowder, aggressively expanded operations and hiring at its brown powder mill north of Wilmington and its smokeless powder plant in South Jersey. Camden shipbuilder John H. Dialogue and Son employed workers to build U.S. naval vessels. 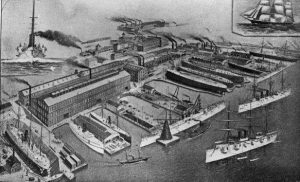 In Philadelphia extensive shipyards such as William Cramp & Sons and League Island Navy Yard, in addition to building large warships, added extra shifts to provide gunboats to patrol and protect coastal waterways. Workers at Midvale Steel and the Frankford Arsenal worked around the clock to produce naval artillery and small arms ammunition, while smaller companies and seamstresses working at home labored to provide American fighting men with apparel and accoutrements. Everything from uniforms and tents to buttons, blankets, caps, and summer drawers were stored or produced in the Schuylkill Arsenal. While the war with Spain benefited some industries, the conflict in Cuba threatened to disrupt others. During the early months of 1898, as tensions increased between the United States and Spain, local cigar manufacturers, anticipating hostilities, imported as much tobacco from Cuba as they could, even purchasing supplies previously shipped to Europe. By the time war began, farsighted Philadelphia-area cigar makers had stockpiled enough Cuban tobacco to keep their workers rolling and their customers smoking for at least another year. Philadelphia sugar manufacturers faced a different dilemma. An ongoing two-year struggle between revolutionaries and Spanish authorities had already impeded Cuban sugar exports and forced desperate refinery owners to search the world for other sources of supply. When war between the United States and Spain began, raw sugar from such distant places as Java, the Philippines, Egypt, and Mauritius in the Indian Ocean made its way into Philadelphia ports. During the war, thousands of tons of beet sugar from Germany were also imported. These alternative sources of sugar enabled refineries in Philadelphia to continue operating. These auxiliary supply strategies kept the cigar and sugar industries running but increased costs for consumers. Throughout the Philadelphia region, shortages caused by the war resulted in higher prices for food staples such as oatmeal, beans, meat, canned fruits and vegetables, potatoes, coffee, and tea. Flour became exceptionally dear and the price of bread skyrocketed. Prices rose so rapidly that distributors of flour became reluctant to sell large quantities because they expected that they might make a greater profit at a later date. Prices also increased and availability dropped for dry goods such as duck and dyed cotton, which were in great demand for Army use. After suffering two crushing naval losses and with its armies on the brink of defeat, Spain accepted the futility of continuing the struggle and negotiated an armistice that began on August 12, 1898; a formal peace treaty followed four months later. Once hostilities concluded, the city of Philadelphia planned a Peace Jubilee to celebrate the nation’s victory over Spain. 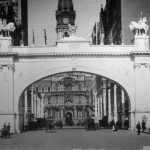 The focal point of the Philadelphia Peace Jubilee was the construction of a towering, electrically illuminated, Athenian arch that spanned Broad Street near Sansom, bisecting a Court of Honor of ornate columns lining Broad Street from City Hall to Walnut Street. The celebration commenced on October 25, 1898, with a grand naval pageant of boats on the Delaware River. Two days later twenty-five thousand soldiers, many from Philadelphia, marched down the Court of Honor under the respectful gaze of President William McKinley. The festivities concluded October 28 with a vast civic parade representing many of the city’s diverse ethnic, social, business, civil, and educational organizations. Spectators traveled from all over the United States to attend, and most major newspapers covered the occasion. As in the rest of the United States, the aftermath of the Spanish-American War led some Philadelphia-area inhabitants to openly question their nation’s new role as an imperial power. After the war, American soldiers remained overseas to occupy Cuba and America’s new possessions: Puerto Rico, Guam, and the Philippine Islands. Generally, these occupations were temporary and peaceful, but in the Philippines U.S. troops combatted a fierce native insurgency for years. Staunch Filipino resistance compelled the Philadelphia American League (1899) to condemn imperialism as a violation of the republican principle of government by consent of the governed. Philadelphia African Americans also spoke out against American colonialism. Black newspapers such as the Philadelphia Defender, Odd Fellows Journal, and the Christian Banner sympathized with the plight of the Filipinos but remonstrated that the United States government should worry less about foreign entanglements and, instead, redress the lack of equality and civil rights endured at home by its own citizens of color. 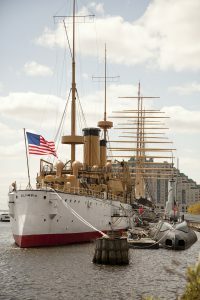 The region later gained a visible monument to the Spanish-American War in the form of the USS Olympia, the flagship of the U.S. Asiatic Squadron, which led a devastating attack on a Spanish fleet in Manila Bay that destroyed every enemy warship without the loss of a single American vessel. This stunning victory brought both Commodore George Dewey (1837-1917) and his flagship national recognition. 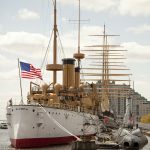 The Olympia was eventually retired in 1922 to the Philadelphia Navy Yard, and in 1957 the Navy ceded the ship to the Cruiser Olympia Association, a nonprofit organization established to acquire Olympia artifacts and raise funds for the boat’s preservation. Docked at Penn’s Landing, the next year the ship opened to the public as a floating museum. The Spanish-American War lasted little more than three and a half months, but its legacy lived on in the Philadelphia region for years. In many ways, the conflict with Spain served as a rudimentary rehearsal for America’s next war, World War I (1917-18). The martial spirit and patriotism displayed in 1898 revived and grew in 1917 as tens of thousands of local men answered the call to join the Army and Navy. The ethos of military production that powered the region’s economy during the Spanish American War intensified during the Great War, and area civilians endured even more severe privations. The Spanish-American War had prepared the region to proceed and persevere through the First World War. Paul A. Kopacz is the recipient of a master’s degree in history from Villanova University. Burr, Lawrence. US Cruisers 1883-1904. Long Island City: Osprey Publishing Ltd., 2008. Dorwart, Jeffery M. and Philip English Mackey. Camden County, New Jersey 1616-1976: A Narrative History. Camden County, New Jersey: Camden County Cultural & Heritage Commission, 1976. Jackson, Joseph. Encyclopedia of Philadelphia. Harrisburg, Pa.: The National Historical Association, 1931-33. Lee, Francis Bazley. New Jersey as a Colony and as a State, Vol. 4. New York: The Publishing Society of New Jersey, 1902. Marks, George P. III ed. The Black Press Views American Imperialism (1898-1900). New York: Arno Press and The New York Times, 1971. Miller, Bonnie M. From Liberation to Conquest: The Visual and Popular Cultures of the Spanish American War of 1898. Amherst: University of Massachusetts Press, 2011. Record of Pennsylvania Volunteers in the Spanish American War, 1898. Harrisburg, Pa.: W. S. Ray, State Printer, 1900. Toll, Jean Barth and Mildred S. Gillam eds. Invisible Philadelphia: Community through Voluntary Organizations. Philadelphia: Atwater Kent Museum, 1995. Traxel, David. 1898: The Birth of the American Century. New York: Alfred A. Knopf: Distributed by Random House, 1898. Vitiello, Domenic. Engineering Philadelphia: The Sellers Family and the Industrial Metropolis. Ithaca, New York: Cornell University Press, 2013. Weigley, Russell F., ed. Philadelphia: A 300-Year History. New York: W.W. Norton & Company, 1982. Zilg, Gerard Colby. Du Pont: Behind the Nylon Curtain. Englewood Cliffs, New Jersey: Prentice-Hall, 1974. Cruiser Olympia Association Collection 1954-1996, J. Welles Henderson Archives & Library at the Independence Seaport Museum, 211 S. Christopher Columbus Boulevard, Philadelphia. E.I. du Pont de Nemour & Company Records 1800-1905, Hagley Museum and Library, 200 Hagley Road, Wilmington, Delaware. J. Hampton Moore Peace Jubilee Celebration Collection 1898-1899, and Carpenter Family Papers, Historical Society of Pennsylvania, 1300 Locust Street, Philadelphia. Universal Peace Union Records, Swarthmore College Peace Collection, 500 College Avenue, Swarthmore, Pa.
USS Olympia, Independence Seaport Museum, Penn’s Landing, 211 S. Christopher Columbus Boulevard, Philadelphia.